*HOT OFF THE PRESS* Our brand new single ‘Royals’ feat. vocalist Helena May is out TODAY. Have a listen on your favourite digital service HERE. Morphing this art pop song by Lorde into a funky soul rendition was great fun. Although the art pop song flavour is gone the lyric’s disapproval of the luxurious lifestyle of contemporary artists remains. Hear, hear! As always, if you want to support us direct – hop on BANDCAMP. In August we released ’Sweet Child O’ Mine’ (what would Slash make of this?) and last week we followed up with ‘Boogie Woogie Bugle Boy’ and funkified this Andrew Sisters Jump Blues classic from the 1940s – bouncy vocals, phat bass, Acid Jazz overtones – have a listen HERE. What’s up with BACKWOOD FIVE? Recently I’ve been traveling back and forth quiet a bit to perform my tunes with Backwood Five. 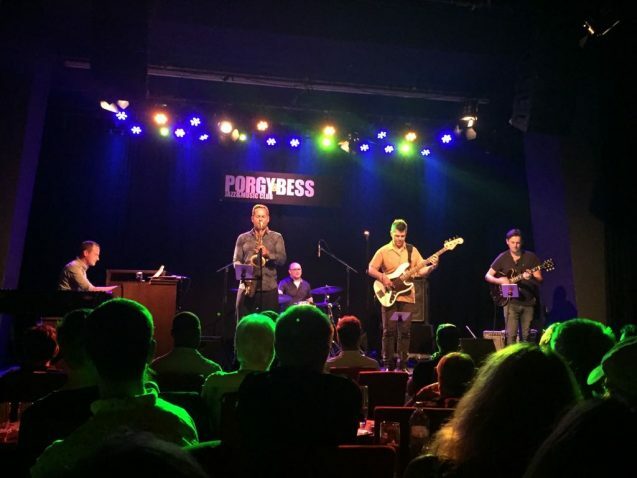 Standout gig for me was playing with a Funkestra/Backwood Five hybrid at the renown Austrian Jazz Club ‘Porgy and Bess’ – kind of the ‘Ronnie Scotts’ of Austria. It was great to take Ross Stanley (Hammond organ) and Mike Outram (guitar) who are frequent Funkestra players to Vienna and introduce them to Josef Hinterhoelzl (aka Joe Backwood) and Andreas See (tenor saxophone). Joe has already been over a few times and this time it is Andreas See turn to perform with the Funkestra on 2nd. 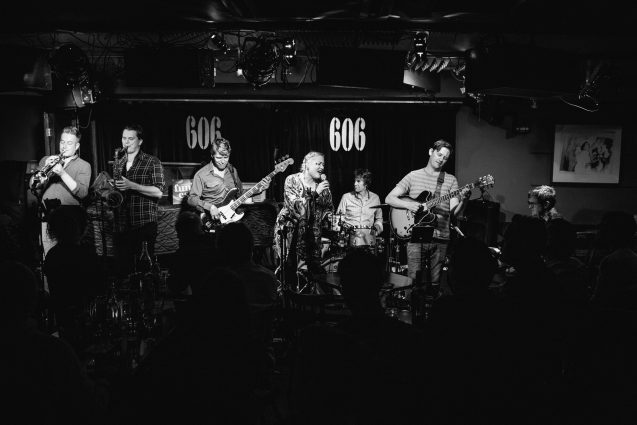 of November at the 606 Club in London. The ‘Porgy and Bess’ club is very close to my former University stomping ground, the Vienna Conservatory so it was doubly satisfying to not only come from Britain to strut my bass but also come with my bag of funk tunes and air them to a – what seemed – a very responsive audience. Thank you for Joe to organising the whole thing, grooving his socks off on the drums but also to all my friends – new and old – who showed up to support our groove music. The whole thing is very much in keeping in my vision to encourage a lively exchange between British and Austrian musicians – which is an obvious desire as the UK is my chosen country of residence and Austria is my country of origin:-) Hot of the Press – Joe will join Andy for the next 606 Club gig (see below). w/Helena May – vocals, Jim Watson – keys, Rory Simmons – trumpet, Andreas See – tenor sax (Backwood Five, Jazzodrome), Mike Sturgis – drums, Karl Vanden Bossche – percussion, Mike Outram – guitar and yours truly. 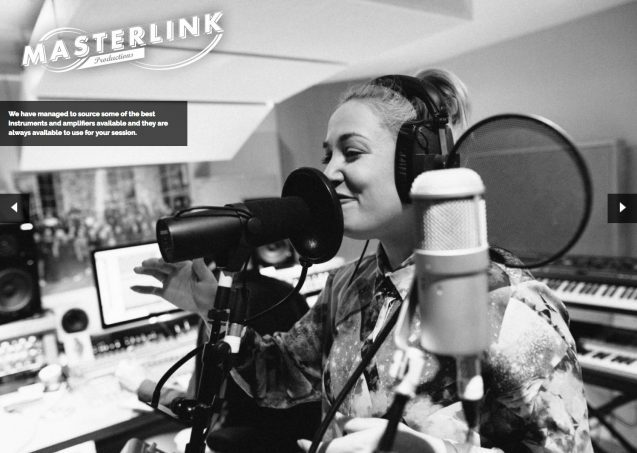 The funkateers will be Helena May – vocals, Jim Watson – keys, Mike Outram – guitar, Mike Sturgis – drums, Sid Gauld – trumpet, Piers Green – tenor saxophone and yours truly steering the ship. West 54 was formed in 2016 to play the best modern funk around with a few sweet classics in there just for the love. They are playing tracks by PBUG, Cory Henry, Brother Strut, Maceo Parker, Lettuce, The Motet, JK, Incognito, The Commodores. 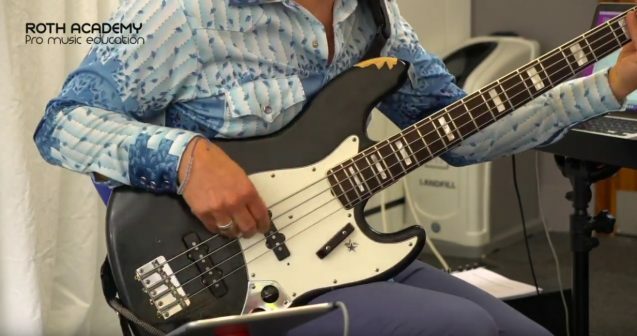 A mixture of professional working musos and some who have kept the love but given into that day job, they have only two rules, it’s hot or it’s not and – it’s pushing them to their limits. They stay true to that. It was great to be invited by Pete Roth to be part of a three day bass masterclass series along side fellow bassists Laurence Cottle and Kevin Glasgow. I had an inspiring time and the entire event can be accessed through the Roth Academy (I think:-) I really like Pete’s educational approach which differs from some of the other educational activities I’ve partaken in. The master-apprentice analogy comes to mind and I do think it works really well! Cant’s wait for Pete to take his Academy up North in the spring! We really enjoyed our time in Boston with Dave Limina and Tucker Antell earlier this year. So much so that we want to reverse events and invite Dave and Tucker over for some gigs/clinics/recording in the spring of 2019. 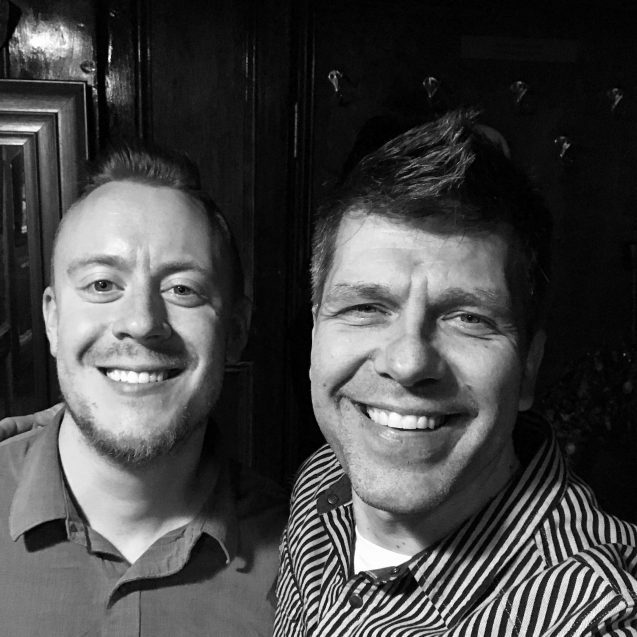 Both Dave – as of recent head of the Berklee College of Music Piano department [CONGRATS FROM ALL OF US!] – and Tucker have brand new records in their bags – happy to introduce new ears to their music. 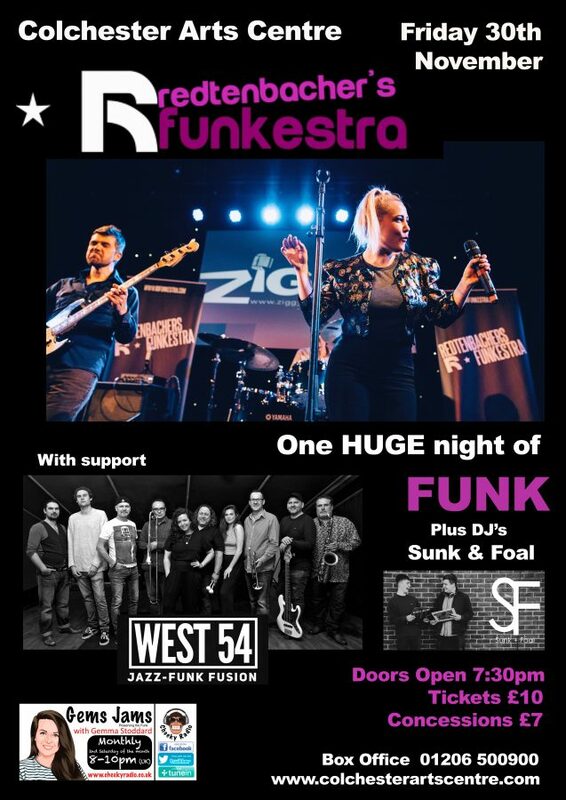 If you, dear reader, want our five piece Funkestra (w/Mike Sturgis on drums and Mike Outram on guitar) to rock…erm funk up…at your venue or school – ping me an email. Also, very exciting, James Welch from Masterlink Productions and myself are planning an epic FUNK weekend at his studio in Surrey. We will feature a whole bunch of artists from the South-East (vocalists and instrumentalists) and will create live recordings with a studio audience. We’ll share the results and videos – this is going to be mega! The Surrey ‘Wrecking Crew’ will be the Funkestra rhythm section as the de facto houseband inspired by legendary studio bands The Funkbrothers (Motown), The Swampers (Muscle Shoals), The Wrecking Crew (Phil Spector Wall of Sound) and Booker T and the MGs (Staxs records). Special! 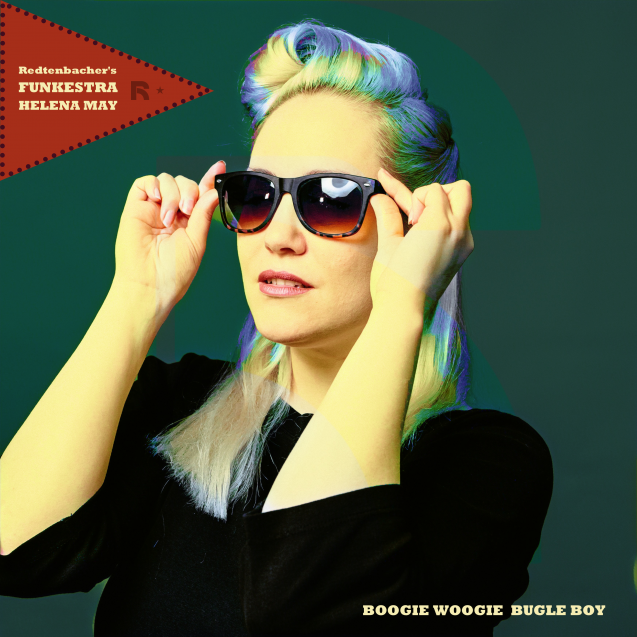 Last but not for the very least – on November 12th the Redtenbacher’s Funkestra ft. Helena May will release their album ‘Part of Me’ on RSB Records – some might say an album of covers – we like to see it more as a collection of re-imagined and funkified pop songs with the signature Funkestra groove. Whatever the label, we hope you’ll enjoy it! Stay well until I’ll see you next which is hopefully soon.